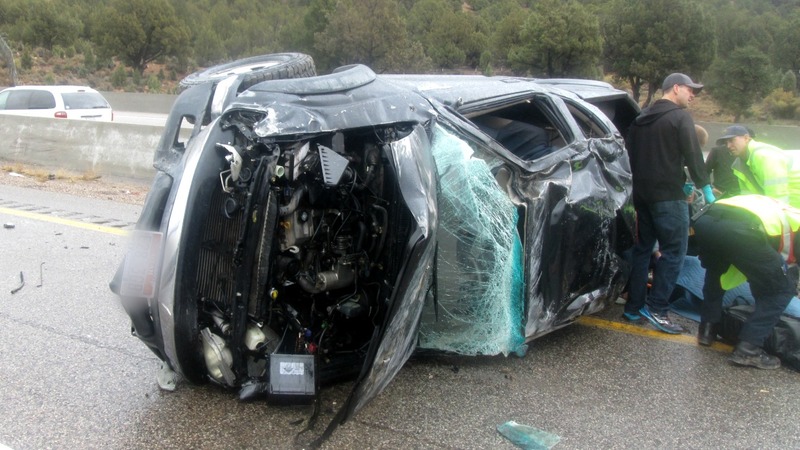 ST. GEORGE — Six crashes on rain-slicked roads were reported in less than an hour on Interstate 15 as responders scrambled to manage multiple scenes, tend to one injured driver and clear the roadway. 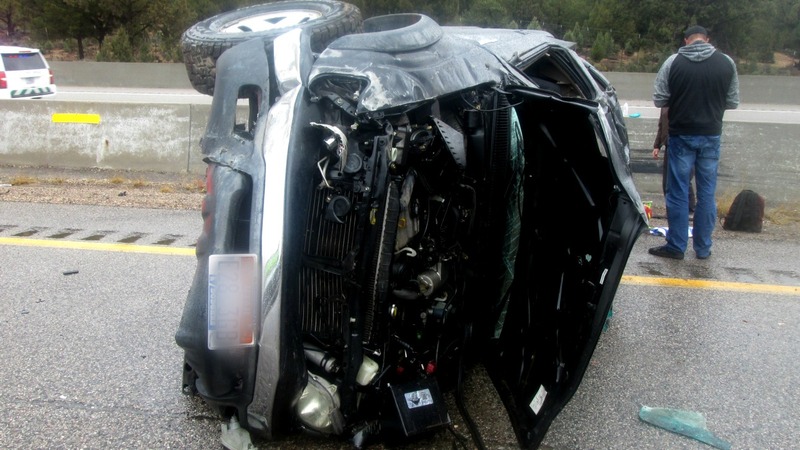 The first crash involved a passenger vehicle that slid off northbound I-15 near mile marker 34, causing damage to the vehicle but leaving the driver uninjured. The second crash was a single-vehicle rollover reported near mile marker 37 on I-15 southbound just north of Pintura involving a small pickup truck with initial reports indicating that a driver was injured. Intermountain Life Flight was launched as emergency personnel were responding to the scene. Troopers found the pickup partially blocking the No. 1 lane with an injured driver still inside of the vehicle. Emergency personnel removed the man from the truck and he was taken to Dixie Regional Medical Center in stable condition by ambulance, Utah Highway Patrol Trooper Jake Hicks said. Life Flight was called back to its base in St. George as weather conditions prevented the crew from landing the helicopter safely. “The driver was conscious and stable so a ground transport worked out,” Hicks added. As emergency personnel were wrapping up the second crash scene a third crash was reported at mile marker 35 and within minutes there were three additional crashes that occurred in close proximity to one another. “There were basically four more separate crashes after the rollover that were all in the same area within minutes of each other on the southbound side,” Hicks said, adding that a majority involved slide-offs and vehicles crashing into the concrete median and guardrails. Hicks said that speed and following too close were the primary contributors to Friday’s crashes, along with weather. All drivers were properly restrained, which is likely the reason five of the crashes were noninjury incidents, “and seat belts definitely saved the driver involved in the rollover,” he said. The roads are slicker than they appear, which creates the perfect conditions for crashes and slide-offs. Hicks cautioned drivers to reduce their speed and increase their following distance during heavy rain or inclement weather. “And always wear your seat belt – always,” he said. The Utah Highway Patrol, Hurricane Fire and Rescue, Utah Department of Transportation’s Incident Management Team, Intermountain Life Flight and Washington County Sheriff’s Department responded and tended to the scene.